An evening dedicated to artists filming their own lives and surroundings. Independent film legend George Kuchar (a major influence on John Waters among many others) appears in Rainy Season, a classic video diary work that alternates between the hilarious, the subversive, and the poignant. Kuchar's Wild Night in El Reno is a short, brilliant "weather diary" of a storm in Oklahoma. Since the early 1980s, Anne Charlotte Robertson has been making an epic diary work on super-8 film. Emily Died is an excerpt from this work, detailing the events of May to September 1994, as Robertson comes to terms with a death in her family and the surrounding difficulties. This screening represents a rare opportunity to see Robertson's brave, highly personal film work. 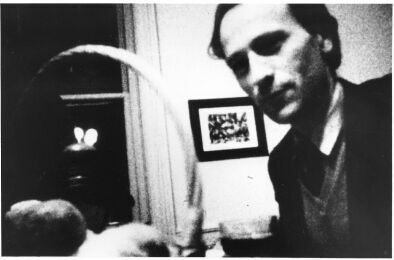 As an originator of the modern diary film, Jonas Mekas is a crucial figure of American independent film. Walden, one of his most highly praised works, is a three-hour diary film consisting of footage Mekas shot in the mid-1960s. (We will screen the first 43 minutes, which stands as a separate work in its own right.) Walden Reel 1 is a collection of exquisite small films woven together to form a larger whole. It is a home movie, a record of the 1960s cinematic underground, a poetic homage to New York, and a document of Mekas's friendships within the avant-garde (including such figures as Stan Brakhage and Tony Conrad), punctuated by extraordinary sequences of time-lapse photography. Above all it is a celebration of the act of filmmaking. A line from Mekas's poetic narration, "I make home movies, therefore I live," provides the title for this film series. "They tell me I should always be searching," he says in the film. "But I am only celebrating what I see." Also included in the screening are three shorter works. Brian Parks's video piece follows his father on a typical work day, finding absurdity and strangeness in the everyday. Gordon Ball's Enthusiasm, in which the filmmaker explores the death of his mother, moved poet Allen Ginsberg to comment, "Gordon Ball makes you cry for life itself." DHPG Mon Amour is a touching home movie of a devoted gay couple and their use of alternative treatments for AIDS. Originally intended as a promotional film for these treatments, it now resides in the collection of the Museum of Modern Art as a classic of personal cinema.